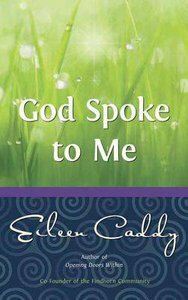 About "God Spoke to Me"
Eileen Caddy was instrumental in creating the international spiritual community centered around the Findhorn Foundation in the North of Scotland, and in 2005 she was awarded an MBE (Member of the Order of the British Empire) from the Queen for her lifelong service to spiritual inquiry. She is the author of "The Dawn of Change, Footprints on the Path," "God Spoke to Me," "The Living Word," and "The Spirit of Findhorn. "Michael Scott is the founding member, lead singer, and chief songwriter of the rock band The Waterboys.